Private Lodge auf 3 Acres 1 Meile in die Stadt. 6 Schlafzimmer Suiten. Colorado vom Feinsten! Monat für Monat ist ebenfalls verfügbar. Fragen Sie nach Ihrer Rate! Privater ganzjähriger Rückzug! Colorado Perfektion! Dies ist mein Lieblingsschloss; nässende alle, dass Sie einen Urlaub in den Bergen zu bieten nach Hause wollen. Wenn Ihre Reisepläne erlauben für einen Monat oder so .... Blick auf jeden Fall bei The Black Bear Lodge! The Black Bear Lodge ist ein erstklassiges Miethaus in Breckenridge! 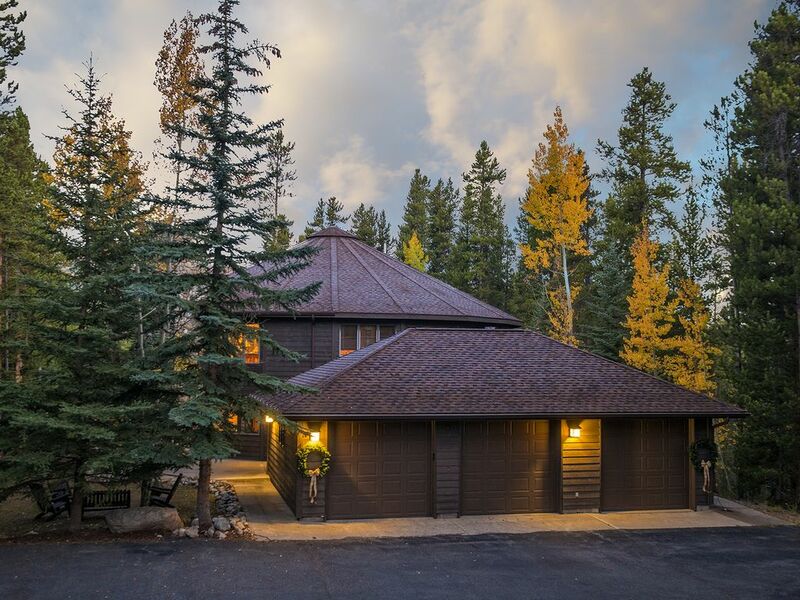 Dieses großartige Mountain Lodge ist privat und ruhig gelegen, aber leicht zugänglich und nur 1 Meile von der Spitze 9 Lifte und Herzen der Innenstadt Breckenridge. Umgeben von hohen Kiefern, fangen Sie noch Skigebiet Ansichten der Spitzen 8, 9 und 10. Venture außerhalb und erleben Sie einen Gebirgsbach, der neben dem Grundstück verläuft und fließt das ganze Jahr über. Privat doch nah an alles! Die Gondel ist nur 2 Meilen von der Black Bear Lodge. Sechs individuell eingerichtete Schlafzimmer-Suiten jeweils mit Kabel-TV und eigenem Bad. Gourmet-Küche und Essbereich, der 12 Sitze. Frühstück Bar mit 4 zusätzlichen Sitze, 2 Wet-Bar; Beheizte Boot Lagerung; Geräumiges Wohnzimmer mit Wrap-around-Decks und Ansichten. Große TV im geräumigen Große Zimmer, Familienzimmer, 2 Stein Gas-Kamine, Billardtisch und Kicker in Rec Bereich; Whirlpool auf dem Deck. The Black Bear Lodge ist ein Urlaubserlebnis ... Wenn Sie nach Breckenridge kommen ... Sie wollen hier bleiben! 'Spectacular' ... 'Herrlich'... "Unser Lieblings Rückzug in Breckenridge '... "Vielen Dank für einen Traumurlaub!" Sommerzeit: Seien Sie sicher, dass die Natioanlly Acclaimed Gärten der Hendrix Startseite zu besuchen ... Quer über die Straße! Jedes Zimmer verfügt über ein eigenes Badezimmer. 2 Kamine, 8 Kabel-TV, neue Hot Tub, 2 Gas-BBQs, Fußbodenheizung, 3 Hektar, Private, River führt Vergangenheit Eigentum, Skigebiet Aussicht, professionell eingerichtet. Comfortable home for a large family gathering! We really enjoyed our stay at Black Bear Lodge. The bedroom set up was perfect for our mixed group of couples, singles and families. There was delicious soup and bread waiting for us, which was a nice treat! The home was well stocked with lots of towels, blankets, pillows, 2, possibly 3 pack n plays, several high chairs, space heaters, legos and games. While it is about a mile south of Breckenridge, we were able to get Ubers and food delivery quickly. Overall the lodge was just what we needed for our long weekend stay. Perfect home for a large group! Greeted with a wonderful soup, bread and music as we arrived. Highly recommend!! We thoroughly enjoyed out stay at Black Bear Lodge, a spacious, conveniently-located and beautifully-appointed house. It was made even better by catering from Kelly at Ridge Street Kitchen, who cooked for us on two nights. Kelly's food was as perfect and fantastic as the accommodation. Support from Jane was terrific, too: we had a problem with the heating and she had it fixed within half an hour of contacting her. I would recommend this place without hesitation! Perfect home for all ages and needs! We were traveling with 11 adults, two one year olds, two four year olds and a theee year old. The house was perfect for sharing time together and provided privacy when needed. It is conveniently located for all the activities one could imagine. The kitchen was great, well equipped and easy to use. We traveled during the "Breckinridge Fires" and Jane was very responsive to our concerns and offered to work with us if we decided not to come. Thankfully all was good. The soup, bread and chips was the perfect welcome. Highly suggest working with Jane and her properties. When the road takes us to Colorado again we will definitely check Jane's properties first. We had a wonderful experience at the Black Bear Lodge. We were welcomed with a warm crock-pot of apple/sausage soup and a nice note from the owners. The house is spacious with great room set-ups to handle multiple families. Everyone enjoyed the large hot tub on the porch with the beautiful trees around it. The game room was a big hit with the kids. The Minimum Age requirement to rent this property is 30. Guest renting, must also be staying at the property. WE DO NOT Rent this Property to College Groups; or College age groups. There is a Minimum Night Stay Requirement on all of our Properties. Sometimes however, if a GAP is available; We will honor less than the Minimum Night’s Requirement. Please inquire. Maximum Occupancy: 18 (including children) A Refundable Security Deposit of $1500 will be added to your TOTAL Quote. The Damage/Security Deposit is fully Refundable. A Security Sheet will be included in your Confirmation Package from JanesLodges. Sorry, No Pets here. If traveling with your pet; Please check listing #1256 and #78697 No Smoking; Strictly enforced All Guests are Required to Review, Sign and Send back to JanesLodges AFTER RESERVING AND PRIOR TO CHECK-IN: Liability Waiver, Security Sheet, And when applicable a Credit Card Form. These items will be emailed to you from JanesLodges.